Recurring Deposits are a boon for all those looking to save money for future emergencies by making regular monthly installments. Kotak Bank’s Recurring Deposit is a valuable RD scheme with a good interest rate and helpful policies. In this article, we bring to you all the important details you need to know before you begin an RD investment with Kotak Bank. The minimum deposit for a Kotak Bank RD starts at Rs. 100. For senior citizens, Kotak Bank offers RD rate up to 7.25%. 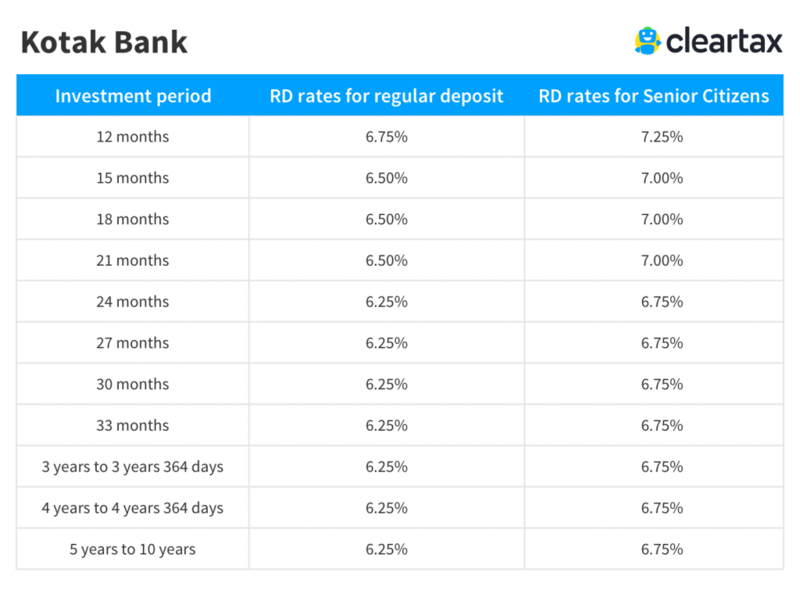 Recurring Deposit: Should You Choose This Scheme? The reason to start any type of savings depends on your personal goal. If the goal is to create surplus wealth by making monthly payments, then Recurring Deposit is not the best way to go about it. In fact, you can earn more by investing your surplus savings in Mutual Funds SIP. Before you choose an RD scheme, do take a look at the benefits of Mutual Funds and make the best decision for your future. Kotak Bank Bank users can withdraw money from their RD account even before the RD matures i.e. before the tenure of payment finishes. However, the bank does not allow partial withdrawal of the amount from the RD account. According to the Income Tax Act 1961, all Recurring Deposits; including Recurring Deposit schemes from Kotak Bank, are subject to tax. This is because the earnings from an RD account is included in your yearly income and becomes a part of your taxable income at the end of the financial year. TDS (Tax Deducted at Source) at the rate of 10% is deducted from the interest earned if the yearly interest amount exceeds Rs.10,000. However, you can file either Form 15G or Form 15H to save TDS on your RD earnings. Kotak Bank Bank offers different types of Recurring Deposit schemes for the benefit of its users. The most common of this is the Regular RD scheme. Regular RD: Create a rainy-day fund and secure your future by investing regular monthly amounts in your Kotak Bank RD scheme. The minimum tenure for this RD account is 6 months, and you can increase it to a maximum of 10 years. Many people in India opt for an RD savings scheme and the interest rates for the schemes vary from one bank to another. The rates depend on the goal of the RD scheme chosen, the tenure, and the minimum monthly deposit amount. Generally, higher interest rates are given for RD with tenure of 15 months and above. Also, senior citizens and women, investors may enjoy higher interest rates for RD schemes in some banks.